Q. What is the difference between hand-made jewellery and cast jewellery? A. Casting involves melting solid metal into a liquid form and pouring it into a mould. As with most liquids, bubbles form during the pouring process and these little bubbles (porosity) remain in the metal when it solidifies, create weaknesses in the finished item. Hand-made jewellery is produced by beating, rolling and hammering a solid piece of metal into the required shape. This repeated working of the metal squashes and forces any air bubbles leaving the metal much denser and stronger than a piece of jewellery that has been cast from CAD (computer aided design) or wax carving. Q. Can you please explain the differences between platinum, white-gold and palladium? A. Platinum – is a naturally “white” (meaning grey) metal. It does not oxidise, so the colour of your ring will not change from the day you first receive it. 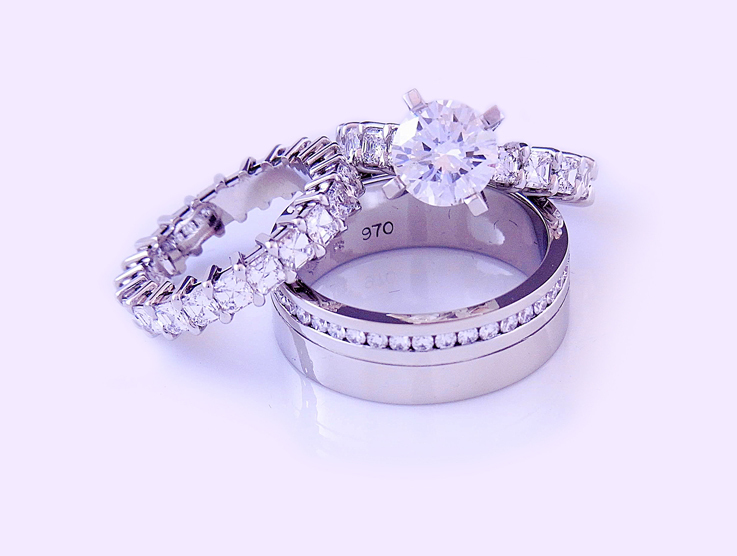 Platinum is also the most dense of the metals used to make fine jewellery. With a specific gravity of 21, which is nearly double that of palladiums at 12 and well above white-gold at 16, your platinum jewellery will last longer than any other alloy. White gold – is made by alloying yellow gold with other metals to change its colour to white. This results in a metal that is not quite as “white” as platinum. At Harry Rose Jewellery, we do not use nickel in our white gold alloy as some people have allergic reactions to nickel in jewellery. We will not rhodium plate your jewellery unless expressly asked as we believe it is better to give the customer a piece of jewellery that will not look totally different in six months when the plating wears off. Palladium – is a naturally white metal but does not have the density of platinum or white gold. At Harry Rose Jewellery we use 950 palladium alloyed with ruthenium. This makes the metal more workable and practical for jewellery. A. Fluorescence is the visible light some diamonds show when exposed to ultra violet rays. In most diamonds, the colour shown from the fluorescence is blue but can be yellow or other colours. Only about 10% of diamonds with fluorescence will have a noticeable visible effect. Fluorescence diamonds will generally be cheaper than a similar diamond without fluorescence. It is very important that you look at a diamond with fluorescence before buying it. Q. Can you please explain the clarity of a diamond? Flawless The diamond has no internal or external flaws. Internally Flawless The diamond has no internal flaws. VVS1 – VVS2 Very, very slight inclusions. Internal flaws hard to find under 10 x magnification. VS1 – VS2 Very slight inclusions. Internal flaws easily visible under 10 x magnification. SI1 – SI2 Slight inclusions. These are visible to the naked eye. I1 – I3 Large inclusions immediately apparent to the naked eye. It is important to understand that stone graded VS1 (for example) could have several tiny inclusions instead of one larger one. The number next to the grades does not reflect the number of inclusions in the stone. Q. What is an inclusion? Pinpoint inclusions Minute crystals usually while in colour. Cleavages These are cracks in the diamond. Cleavages are usually caused by,internal strain on the stone and these diamonds should be avoided. Clouds A tiny cluster of pinpoint inclusions. Feathers Tiny cracks in the stone resembling a tiny feather. Crystals Small crystals of minerals or other diamonds inside the stone. Needles Long thing lines of pinpoint inclusions. Q. Can you please tell me a bit more about the cut of a diamond? A. 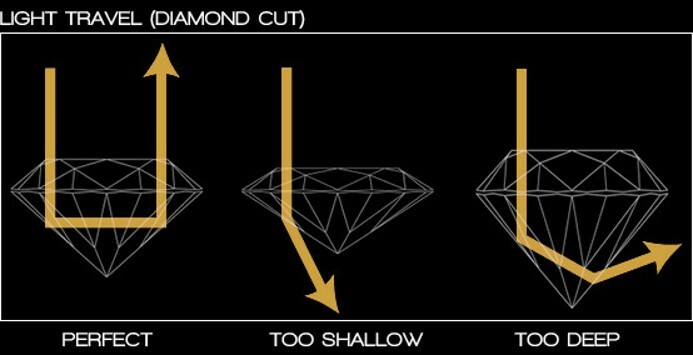 There are many factors affecting the cut of a diamond. The first is the proportions of the diamond. It is crucial to have the right proportions to ensure the diamond is not ‘leaking’ too much light. The symmetry of the diamond will also impact the appearance of the stone. A lot of diamond merchants will push one aspect of the diamond at the cost of another. It is no good having a ‘hearts and arrows’ diamond if the proportions of the stone are not right and vice versa. The table percentage and girdle width are also factors that will affect the appearance of the stone. It is crucial that we keep all of these factors in mind when choosing a diamond. Once again it is crucial to look at the diamond first hand to see the balance of all these factors.